Captain Picard warps onto CBS All Access streaming platform. For the past two seasons, Trek fans watched Star Trek: Discovery – a prequel series. These days, they’re waiting to see what the new sci-fi spin-off show will be about. The nail biting suspense can finally lift, as the long wait ends. Now a core focus of Jean-Luc Picard’s futuristic adventures can be revealed. The Starfleet veteran, well known for his gleaming bald pate, scours our galaxy for a cure. Gene Roddenberry’s Picard will go where no man has gone before searching for a cure for baldness. Let’s see what bald cures are out there…. In Star Trek: First Contact, Riker, Troi and Geordi meet up with warp inventor Zephram Cochran. After informing him they’re Starfleet professionals time travelled from his future, he replies, ‘You’re all astronauts… on some kind of star trek.’ If Captain Picard stood Earthbound among his crew, the quirky engineer may have amended his statement. A Bald Trek? 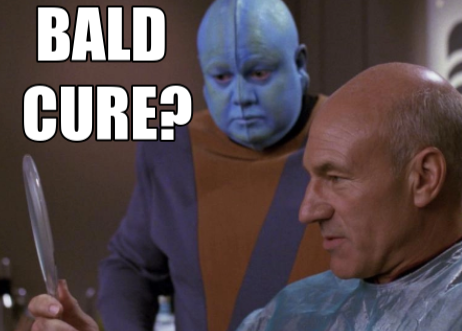 To the bald men of the TNG era, it’s really no joke. Laugh Trek adjusted our squirrel tail hair pieces and loaded up on our drugstore minoxidil. We sat down with a few Captain Picard producers to get the skinny on the bald. Baldness? You’re kidding. This has gotta be some kind of joke. It’s no joke. And no, we’re not kidding in the least. The hairless future which Gene Roddenberry’s The Next Generation painted so clearly for us gave our audience blindingly bald men. We’re quite aware that Captain Picard is probably the most famous baldy human of them all. However, there are also bald aliens like his barber, Mr. Mott. Picard’s going on a quest. He’s determined to change all of that baldness with this spin-off series. Picard’s Enterprise barber is bald? Is that a fact? Yes, so all this talk Picard wants a certain look or could easily get a bald cure hypospray shot from Dr. Crusher doesn’t really hold water. Baldness is a very real, painful affliction in Picard’s time. As you know, it’s still an issue in our own society. We’re going to devote a lot of time and energy in exploring the answer to this crazy cranial dilemma. Isn’t this premise just a tad thin for a whole show? Sorry, I couldn’t resist. Sure. Thanks much for the gentle mockery directed at our sincere efforts. Look, joke, mock and revel all you want in the fact tortured men are still bald in Picard’s time, but in looking for a cure, there will be all sorts of side, ancillary benefits. Side bald benefits? Whoa. Now we’re intrigued Such as? The great time investment spent trying to cure our space ace baldies will bring us to exotic new worlds. Star Trek is all about exploring. What better way to explore the galaxy then sleuth out cures for baldness? We’ll meet fantastic and weird new aliens. These aliens will be bald experts – well versed in the ways of being bald and hairless. They may not actually possess the cure, but they’ll point our valiant crew in the direction of finally curing what hails Starfleet’s Jean-Luc. This journey will end in a glorious celebration of battling the big bad, bald. What could be more interesting or cooler?